Summers just seem to fly by so fast! Jeez. It seems like yesterday I was heading out to my car anticipating what this summer would be about. I knew it would have a lot of running and had hopes of lots of beach time. Like all summers, time got away from us. Track took over our lives for a majority of it. But we still managed to have a great summer. Lots of swimming, camping, and letting my kids just be kids. It was perfect! And just like normal, the last week of summer comes and I feel like I need to provide my kids with a fun activity each day - so we did. There was one rule though. I had to keep it low key because Tucker had a cyst removed last week and had doctor's orders to not overdo it. Monday was all about the mini golf and ice cream. Low key. Fun. Lots of laughs. And of course jump trampoline jumping! Because that's why I bought the trampoline... I think I like it more than the kids. Tuesday we had plans to go to a water park but upon our arrival there was a "closed for the season" sign. It was okay. We had a follow up appointment with Tucker's doctor and his building was right beside the water park. So we were going in that direction anyway. We just wanted to swim afterwards! It all worked out because it started raining and who would want to be at the water park in the rain anyway...so we went bowling. Apparently my kids like bowling. Who knew? 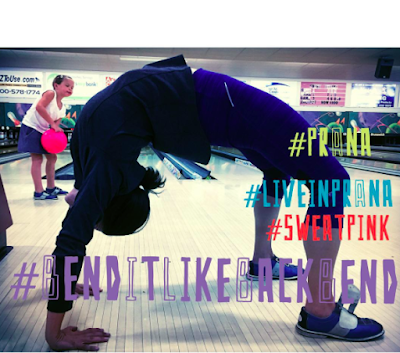 And apparently bowling alleys are a great place for backbends. 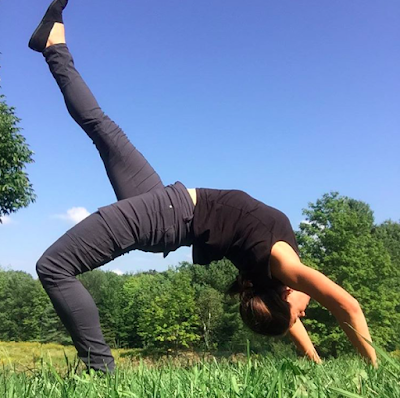 Good thing my kids are oblivious to my yoga moves in public...and my boy takes my photos. Then soccer practice for my girl. She is seriously loving it. And I am loving that she is the only one playing a sport at this moment. No worries...in two weeks dance will start for her. And then Tucker tries out for the soccer team. It was a little chilly and I was super happy to have my new Prana Bourke Top. Sporty and warm. I'm kinda excited to wear this back to school! Wednesday started out as another rainy day - so we went to the movies. We had to try a new place called Smitty's that serves meals while you watch the movie. That was super cool! Then of course we needed to get the obligatory back-to-school hair cuts! 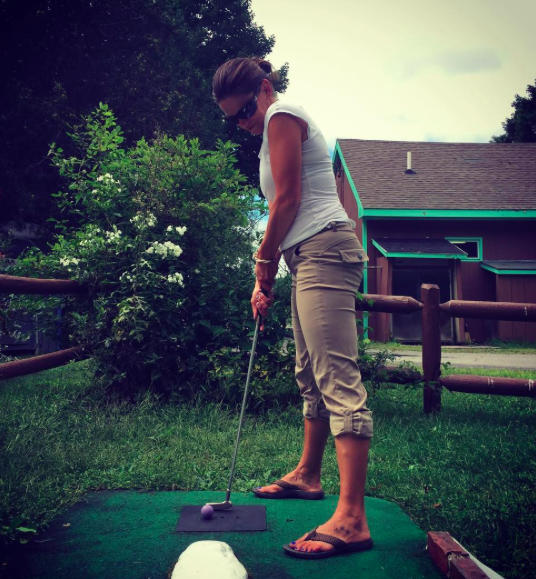 And no day is ever complete without a little wheel in my Prana Meme Pants! Again, completely wowed by these stretchy pants. Comfortable. Cute. It will make going back-to-school a little less painful. Thursday was a hiking day at Bradbury Mountain. We didn't really need to pull out the hiking bags, but Tucker insisted. He packed enough snacks to last him a week! I got to wear my Halle Pants this day. I've had these pants and still love them! They roll up for a casual look and are super flexible. We followed up with a trip to a local pond for some fishing. We had the place to ourselves and it was incredibly peaceful. A perfect way to end the day. Friday's forecast was the warmest for the week...which meant BEACH DAY!!!! The kids and I decided we wanted to go to a beach we hadn't been to in a while, so we chose Reid State Park. I had forgotten how cool it is there and how many fun things we could do. There's a lagoon, lots of rocks to explore upon, huge waves to play in and run and so much more! Happy and relaxed. The perfect kind of beach day... in my Quinn Top. I've had this top and wear it all of the time! And why not a little dolphin pose on the beach? It seemed fitting. Don't you think? I'm thankful for the summer with my kids and and couldn't have had a better summer. I think we're all feeling rather happy and refreshed and ready to take on this school year. I know I'm getting there and wrapping my head around this new school year. Ginger Top and Meme Pant. Stylish, stretchy - I'll want to live in this forever! Having a few new Prana pieces added to my back-to-school fall wardrobe definitely alleviated some of the pain too. Actually, I've never been excited about back-to-school clothing until now because the thought of going from comfy summer, running/yoga clothes to stiff uncomfortable clothes was just unbearable. Now, I'll be super comfy and rather stylish in my new Prana clothes! Right now I have a 15% off code for my readers to use for the Prana Fall Line - LiveInprAnaF15RWTG. You want these clothes! 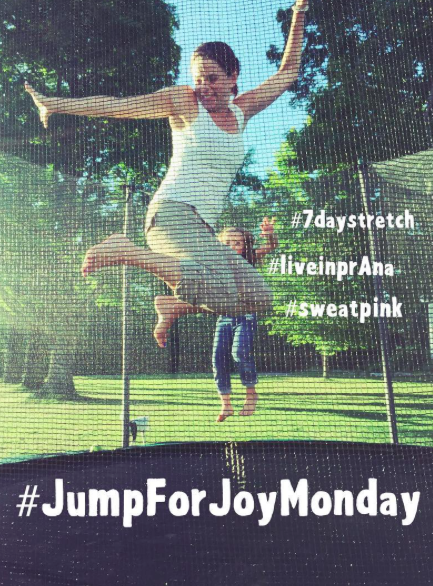 You can seriously #LiveInprAna in them - hiking, yoga, trampoline jumping, bowling, mini golfing, swimming - you can do it in Prana! Heck, I guess you can even go to work wearing it! I know I will! disclosure: I was sent Prana clothing to review and participate in the #7daystretch campaign. I was not required to provide a positive review. As always, all opinions expressed on my blog are 100% my own.